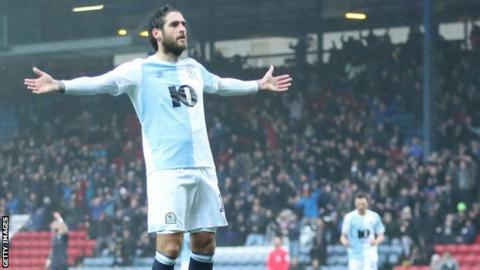 Danny Graham scored a hat-trick on his 100th start for Blackburn Rovers as his side claimed a deserved 4-2 win over Sheffield Wednesday. Goals from Graham and Bradley Dack gave Blackburn a 2-0 lead with less than half-an-hour to go, before Lucas Joao's thunderous strike put Wednesday within touching distance. Graham's second restored Rovers' two-goal lead before a David Raya own goal against the run of play gave Wednesday hope once again. But Graham had the last word as he prodded home from close-range to move Rovers to within five points of the play-off places. Blackburn came into the match having won only five points from their previous six games but started brightly, with the impressive Dack having an effort ruled out and Harrison Reed hitting the post from close range. Rovers' early dominance was rewarded in the 11th minute when Graham slammed home a rebound after Cameron Dawson had saved from Dack. Dack then got himself on the scoresheet early in the second-half when he finished off a fine Rovers counter-attack to double Rovers' lead to score his 11th goal of the season. Wednesday failed to pose a meaningful threat to Raya's goal until the 62nd minute when Portuguese striker Lucas Joao, who spent time on loan at Blackburn in 2017, fired into the top corner from the edge of the penalty area. Rovers re-asserted themselves with Graham's rebound finish in the 66th minute before Raya's own goal gave Wednesday renewed hope. But Graham finally ended the visitors' challenge with a close-range effort in the dying stages to leave Jos Luhukay's side only five points clear of the relegation zone. "I've been in football all my life since leaving school and Danny Graham is as good a one-touch finisher as I've seen. "I've said to him that I'd like to have had him at 25 - he did it once today, like Usain Bolt, running down the right wing for a spell there, he was flying. "We've got some quality at the top end of the pitch and it was evident today. It was a performance we should all be proud of and it's an important three points." "The expectations in this club are high. We are now not living in the past, and fans maybe live in the past from the success, but last season it was also a direction where it was not good enough. "That's why I came in January and now we sit in the same situation so we must fight against that, and we must believe that we can take us to a better period. "Now we are in the worst period, I know that. But in my character, it is not that I will give up, but only solve why we didn't get a good result, or why the fans aren't happy with this." Match ends, Blackburn Rovers 4, Sheffield Wednesday 2. Second Half ends, Blackburn Rovers 4, Sheffield Wednesday 2. Corner, Blackburn Rovers. Conceded by Michael Hector. Attempt missed. Craig Conway (Blackburn Rovers) right footed shot from outside the box misses to the left. Foul by Josh Onomah (Sheffield Wednesday). Ryan Nyambe (Blackburn Rovers) wins a free kick in the defensive half. Substitution, Sheffield Wednesday. Josh Onomah replaces Fernando Forestieri because of an injury. Substitution, Blackburn Rovers. Adam Armstrong replaces Bradley Dack. Substitution, Blackburn Rovers. Ben Brereton replaces Danny Graham. Joey Pelupessy (Sheffield Wednesday) wins a free kick in the defensive half. Foul by Paul Downing (Blackburn Rovers). Goal! Blackburn Rovers 4, Sheffield Wednesday 2. Danny Graham (Blackburn Rovers) left footed shot from the centre of the box to the centre of the goal. Assisted by Bradley Dack. Substitution, Blackburn Rovers. Lewis Travis replaces Corry Evans. Own Goal by David Raya Martin, Blackburn Rovers. Blackburn Rovers 3, Sheffield Wednesday 2. Barry Bannan (Sheffield Wednesday) hits the right post with a left footed shot from the centre of the box. Attempt blocked. Charlie Mulgrew (Blackburn Rovers) header from the centre of the box is blocked. Assisted by Harrison Reed with a cross. Corner, Blackburn Rovers. Conceded by Tom Lees. Attempt blocked. Craig Conway (Blackburn Rovers) right footed shot from outside the box is blocked. Assisted by Derrick Williams. Corner, Blackburn Rovers. Conceded by Atdhe Nuhiu. Corner, Blackburn Rovers. Conceded by Cameron Dawson. Attempt saved. Craig Conway (Blackburn Rovers) left footed shot from outside the box is saved in the top left corner. Assisted by Bradley Dack. Fernando Forestieri (Sheffield Wednesday) wins a free kick on the left wing. Foul by Richard Smallwood (Blackburn Rovers). Lucas João (Sheffield Wednesday) wins a free kick in the defensive half. Attempt missed. Atdhe Nuhiu (Sheffield Wednesday) right footed shot from the centre of the box is high and wide to the right. Attempt blocked. Craig Conway (Blackburn Rovers) left footed shot from the left side of the six yard box is blocked. Attempt missed. Adam Reach (Sheffield Wednesday) left footed shot from outside the box misses to the right. Assisted by Barry Bannan. Attempt blocked. Lucas João (Sheffield Wednesday) header from the centre of the box is blocked. Assisted by Michael Hector with a cross. Liam Palmer (Sheffield Wednesday) wins a free kick on the right wing. Offside, Sheffield Wednesday. Liam Palmer tries a through ball, but Adam Reach is caught offside. Corner, Sheffield Wednesday. Conceded by Ryan Nyambe. Craig Conway (Blackburn Rovers) wins a free kick on the left wing. Foul by Bradley Dack (Blackburn Rovers). Goal! Blackburn Rovers 3, Sheffield Wednesday 1. Danny Graham (Blackburn Rovers) right footed shot from the centre of the box to the bottom left corner.